At the end of June, PRI Central Asia and the Penal Committee, Ministry of Interior, Kazakhstan, supported by the US embassy, jointly organised a roundtable to discuss strategies for preventing radicalisation in prisons. Data shows that the number of those convicted of violent extremist and terrorist crimes is growing everywhere. In Kazakhstan, currently more than 120 people are serving sentences for crimes related to extremism or actions involving violent extremism and terrorism. Prison is a place where the process of radicalisation can either be strengthened or prevented. Currently, the Committee on Religious Affairs and the Penal Committee carry out joint activities aimed at preventing radicalisation of prisoners. These include: forensic examination of religious literature entering prisons; organising meetings with theologians, priests and imams with inmates on a regular basis; working with psychologists to develop approaches to countering violent extremism (CVE). Delegates agreed, however, that these actions are not enough. Programmes in prison should also address the problem of those recruiting others to non-traditional religions and spreading violent extremist ideas. They should be integrated and bridge the transition from prison back into society; and they should not only rely on civil society – which does not have capacity in every region – for delivery but the state must take a role. “Prayer facilities, regardless of religion, have not been functioning in all correctional institutions for several years. 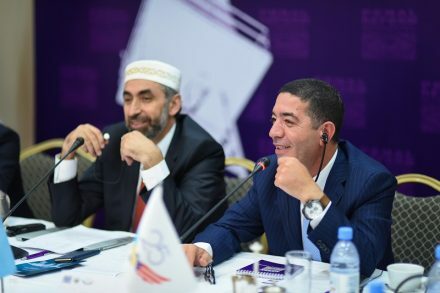 It is crucial to ensure that when exercising their right to practise their religion, prisoners do not come across literature containing wrong and unconventional interpretations, and to ensure that they are not vulnerable to influencing from other prisoners professing such interpretations,” said Azamat Shambilov, Regional Director for PRI in Central Asia. The roundtable was attended by experts from the United Kingdom, USA and Jordan, and national experts and national prison officials. “Different countries have their own approaches to the deradicalisation of prisoners, taking into account the country’s culture and approach and other factors affecting efficiency of the prison service. There is no single right solution. Implementing programmes in prisons is extremely important. We are ready to assist in developing and promoting programmes for deradicalisation of prisoners and prevention of violent extremism in prisons,” said Taghreed Jaber, Regional Director for PRI in the Middle East and North Africa. “It is not sufficient to only take measures in prisons. It needs a broader and deeper approach. There should be a proper understanding of religion in the society itself. There should be no dissident interpretation of Islam. The solution will require involvement of the family and society in its entirety, of mass media and the imams conducting Friday prayers,” said international expert on religion, Imam Mohamad Bashar Arafat, in his speech. “The problem is complex both in its content and scope. It affects both men and women, as well as endangering children”. Following the event, an evaluation and analysis of the situation in Kazakhstan together with recommendations will be produced. Download the post-event press release in Russian or Kazakh.